In reality, our children are far more likely to take illicit drugs or drink alcohol than vape. If they do vape, they’re almost certainly smokers, and are choosing to use nicotine in a way likely to be vastly safer than smoking. Hardly any teens who don’t smoke take up regular vaping. And the small number of children who vape correlates with a massive fall in youth smoking rates, raising the possibility that children are choosing to take up vaping instead of smoking. (Alternatively, it could be that vaping is just not as addictive as smoking). So why are we so concerned? Not because of the data, but because headlines about a teen vaping epidemic are splashed across media and social media on a daily basis. But as we’ll see, that doesn’t reflect what the data is telling us. 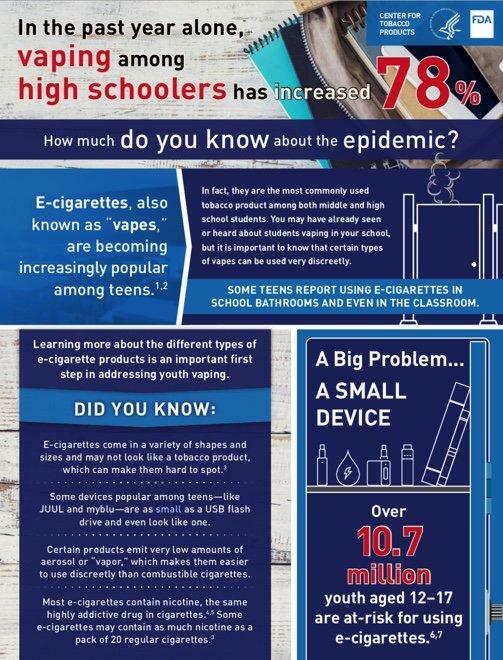 So how many teenagers are vaping? 12% of under 18’s have tried vaping. But the key word is tried. Just 2% of teenagers vape at least once a week, and almost all of these are existing smokers, with just 0.2% of non-smokers using electronic cigarettes on a regular basis. At the same time, the number of children smoking is plunging. The number of regular smokers has dropped from 5% in 2011 to just 3% in 2016. We can’t know for sure that vaping is the cause of the decrease in smoking, but it does show that vaping is not acting as a gateway to smoking. What’s more, many of the children using e-cigarettes are doing so to quit smoking, suggesting that for some children vaping could very well be an exit from rather than a gateway to smoking. Based on the available data and science, Public Health England tells us that vaping is at least 95% safer than smoking. Much of that data is based on older devices - as science and technology improves, and as one by one we identify and eliminate potentially harmful flavour compounds, as well as improving the performance of the coils used to heat e-liquid up, vaping could well become safer again. In short, it’s a massive potential health opportunity. But millions of smokers continue to smoke. And one of the primary reasons for that is that vaping continues to be disreputable, with many vapers continue to believe that is as harmful or more harmful than smoking. Based on this data, I’d make three suggestions. Unfortunately, reporting of teenage vaping has been based on hysteria and hyperbole rather than on the facts. The first step is to ensure the debate and decisions are based on actual data so we can make informed and rational decisions. Teenagers are rebellious. For example, past month data shows that while 4% of children tried vaping, 21% tried alcohol and 9% took drugs (not including nicotine or alcohol). Telling them not to vape, while at the same time telling them that many of their peers are vaping could raise both awareness of vaping and the desire to vape. So any education or public health campaigns has to be carefully considered. Finally, there needs to be a strong distinction between children who have never used nicotine and children who smoke. While we don’t want children to take up nicotine use, it doesn’t make sense to stop existing smokers from switching to vaping. The safest way to do this might be to utilise existing stop smoking services.